Pure ethereal elegance. Soft chiffon ruching on empire bodice with beading accents. Gathers at skirt. Suitable for first to third trimester. Because sizing will vary among brands, please refer to our size chart below as a general guide. 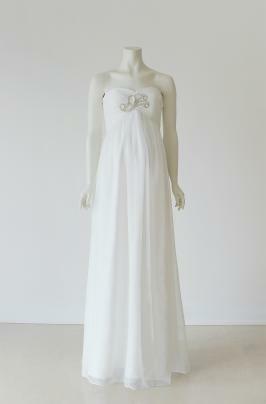 We recommend you order your prepregnancy size if you will be less than 23 weeks by your wedding day. If you have gained significantly more weight than the average or will be 24 weeks or greater by your wedding date, order one size up. Still not sure what size to order? Please contact Customer Service for assistance.